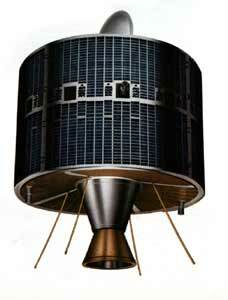 Sirio 1 (Satellite Italiano ricerca industriale orientato) was primarily a geostationary communications satellite. It included experiments measuring the local plasma and field environment and the flux of low-energy cosmic rays. The satellite was launched on a Delta-2313 and was located at 15 deg w longitude. an laser detection/time-tag/retroreflector assembly to permit atomic clock synchronization over intercontinental distances (laser synchronization from stationary orbit - 'LASSO'). The cylindrically shaped spacecraft measured 144 cm in diameter and 240 cm in length including the apogee boost motor. The primary structural members are equipment platforms and a central thrust cone carrying conventional housekeeping electronics in addition to payloads. Attitude, orbit and spin rate control were performed using a hydrazine propulsion system including four thrusters. The spin rate would have been maintained at 90 rpm throughout the two-year nominal lifetime. A mechanically despun antenna relayed S-band telemetry (meteorological and housekeeping), while a traditional omnidirectional turnstile system supported VHF ranging and telecommands, as well as housekeeping telemetry in transfer orbit and as backup geostationary orbit. Sirio-2 was lost in a Ariane-1 launch failure in 1982.